Can we talk about how great this summer has been? Because summer 2014 is totally crushing it. First, the weather has been absolute perfection. Long days at the beach, salty swims in the ocean, and a sail somewhere in between? Simply incredible. My skin is tan, my hair is wavy, and life just feels good. And the al fresco dining! I simply cannot get enough. I’ve already indulged in several sunset suppers filled with lobster rolls and rosé, and my gluttonous self has no plans of reigning it in. Nor do I plan to stop eating this insanely easy crostini, because this baby right here is mega faboosh. 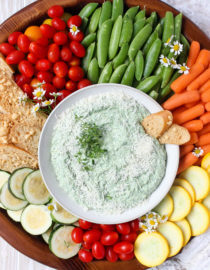 First and foremost is the art of garlic whipped feta, which isn’t so much an art as it is throwing three ingredients in your food processor and pressing pulse. But regardless of how simple the execution might be, the results are seriously mayj. Airy and super garlicky, this whipped feta works just as well here as it does with pasta (did that), on a sandwich (it happened), or straight by the tablespoon (obviously). And the blistered cherry tomatoes? Simply dreamy! At first I was just going to slice cherry tomatoes on top — also a legit option — but something about charring these ruby nuggets just sounded too good to pass up. Luckily the blistered tomatoes take barely any effort, all you need to do is thread them on a skewer, broil for 10 mins, and voilà! Juicy tomato perfection with texture and flavor to kill. I finished these off with some shredded basil and canned sliced olives, and that was it! No muss, no fuss, just crisp, fresh deliciousness ready in a mere 15 minutes. And doesn’t it just look so damn summer-y, too? Pre-heat oven to Broil. Amply grease small baking dish (used for tomatoes). Slice baguette into 1/2″ slices, then broil for 1-2 minutes on either side until just beginning to brown – The baking sheet that you toast the bread on doesn’t need to be greased! Set aside once toasted. 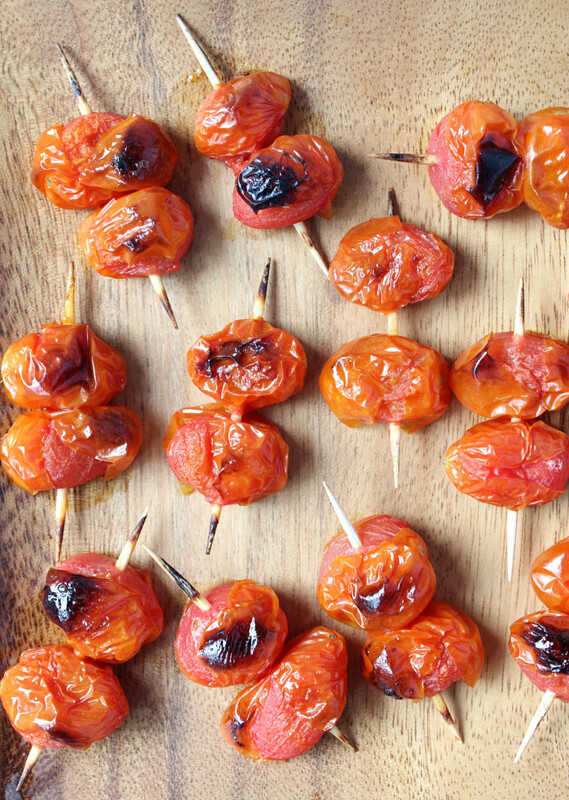 Thread cherry tomatoes along mini-skewers or toothpicks, then arrange in generously greased baking dish. Broil for 8-10 minutes until tomatoes are popped and blistered. While tomatoes broil, in food processor combine the feta, cream cheese, and garlic, pulsing until a whipped consistency has formed (~5 minutes). 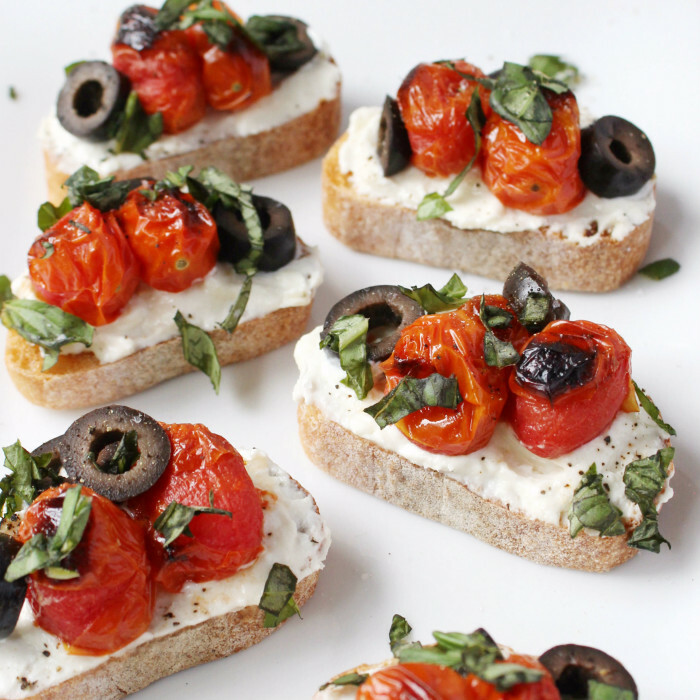 When ready, slather whipped feta over toasted bread, then top with tomatoes, olives, and basil. Lightly season with salt & pepper, then immediately plate and serve. 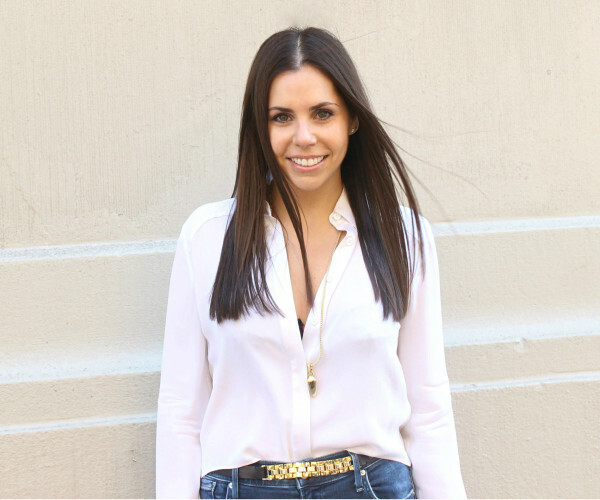 What a fabulous Greek twist on an Italian staple! LOVE it! I totally know how you feel, Christine! I just got married last September and my life was pure wedding craziness! I loved (mostly) every minute of it, but I had no life last summer between all of the events going on. But you’ll survive! Enjoy this time, craziness and all! 🙂 These crostinis look AMAZING! I’m literally drooling over my keyboard. 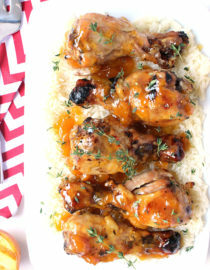 These are my absolute favorite ingredients, smashed into one! Beautiful! 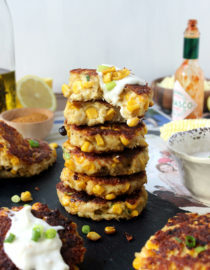 Ok, so these look amazing. I’ve got a loaf of bread ready to become these amazing looking crostini! thanks Cindy, it’s so nice to know everyone has dealt with the same craziness too!! and yess definitely get some garlic whipped feta going for that loaf stat! Hahahaha oh the joys of getting married. Isn’t it funny (or not so funny) how everyone seems to have an opinion… and then feel the need to actually share it with you?! I feel your wedding woes. In the end it’ll all be worth it and you’ll have an amazing day!!! 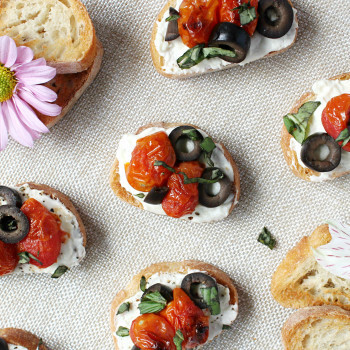 Loving the sound of this crostini… especially that whipped feta! Yum! that’s exactly the kind of thing this app is perfect for – low key and simple summer enjoyment 🙂 and ugh I can only imagine the baby opinions, but from the look of things it def seems that you have quite a handle on it girrrl! They look beautiful Christine. Love the colors and the flavors! Haha, you have me cracking UP over here Christine! Ugh, I do NOT miss being a bride. But once they walk down the aisle, and have their first glass of champagne, you’ve never seen a happier girl. It’s all worth it in the end. I promise. Hugs to you friend! And don’t feel pressure to post a ton. You have enough on your plate as it is. We’ll all still be here for you when you’re back and a Mrs.! This crostini sounds delicious! You had me at whipped feta! 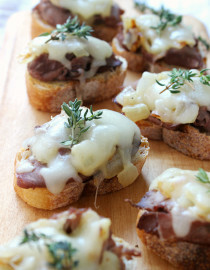 I love these crostini! So delicious, all the flavours are amazing! 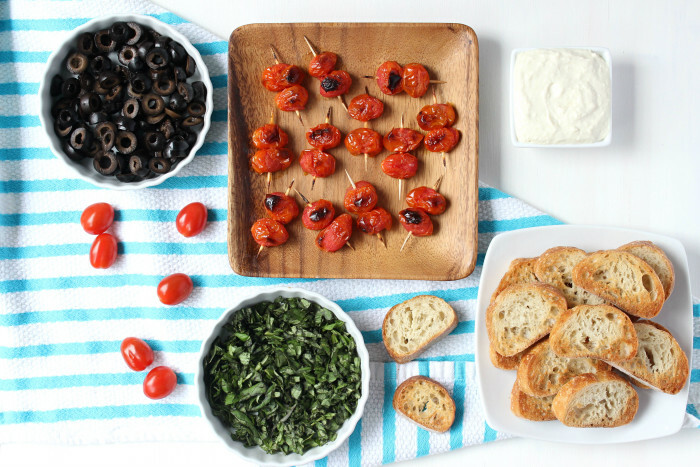 That whipped feta also sounds amazing with the cherry tomatoes! haha I love when insta draws people in!! and thank you for the advice, I’m just trying to take it one day (and one glass of wine) at a time! This looks fantastic! Too yummy to pass up! Oh girl, I had missed your posts so much! Looks like summer is treating you well hehe. Yay for al fresco dinners! 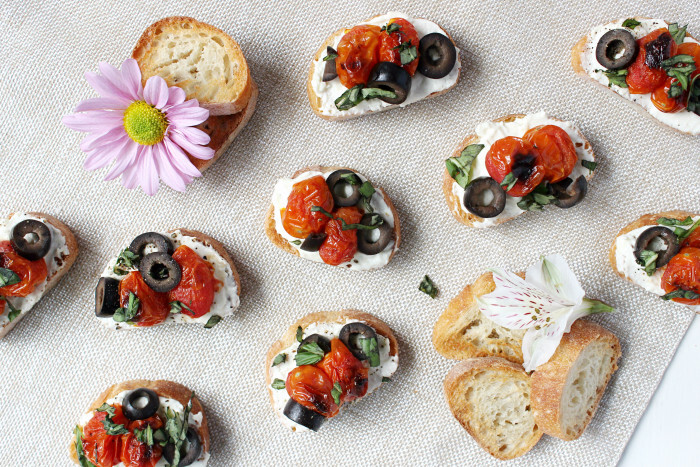 Especially when they involve these gorgeous crostini. Whipped feta??? I’m soooooo in. Wowwwwwwww, this looks amazing! Good luck with the planning, it does sound crazy time consuming! 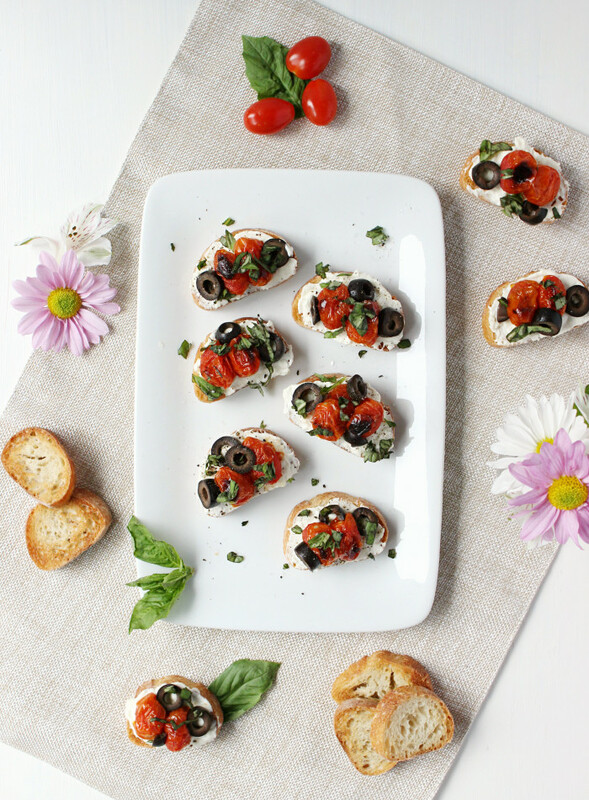 One post a week is totally fine especially when it’s something as delicious as these crostinis! 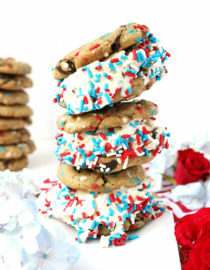 These look like perfection! Nothing wrong with posting once a week! I’ve been doing that for awhile in preparation for how swamped I’ll be in dental school in a month. However you make it work is great! Good luck with all the planning!! I have been missing your posts, but I totally understand. I am giggling a bit here thinking of you turning into bridezilla. Love the way you describe it. So funny. It totally happened to me too. Ha ha. 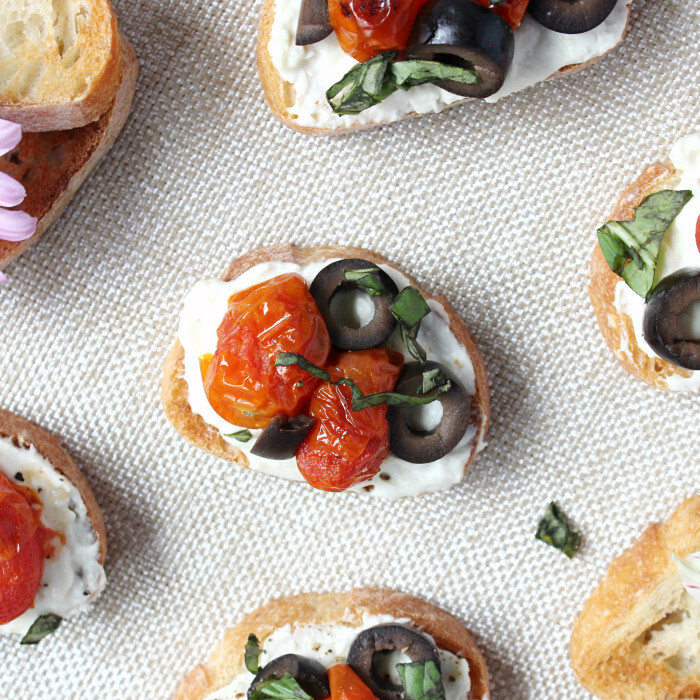 Love these little noshes, and the idea of eating them alfresco with some rose. Heck yes! Also I was a complete bride-zilla. It’s just a lot of stress at one point and I think I was full time working and school. Planning a wedding and getting everything done is a ton of work!! Good luck girl!